Teyba Naser, an Ethiopian living in Albuquerque, NM, accepts congratulations from the crowd after winning the women’s race in P.F. Chang’s Rock ‘n’ Roll Marathon. The P.F. Chang’s Rock ‘n’ Roll Marathon and Half Marathon races were held today. It was a great day for marathon. About 50 at start time, it had warmed up to mid 60’s by late morning. In the half marathon, American Olympian Ryan Hall was expected to win but didn’t. Canadian Simon Bairu won easily. On the women’s side, American Deena Kastor was expected to win and she did. The real news though was in the women’s full marathon. 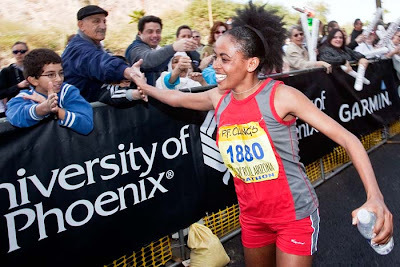 Teyba Naser, an Ethiopian living in Albuquerque, NM, easily won the women’s 26.2 mile race. It’s news because this was her first full marathon. Nassar is an accomplished half marathoner but she had never run a marathon before today. She was not considered an “elite” marathoner and her win was quite the upset.